Mister Glum opens fire upon the trio of superheroes that have come to Dimension-X to apprehend him. 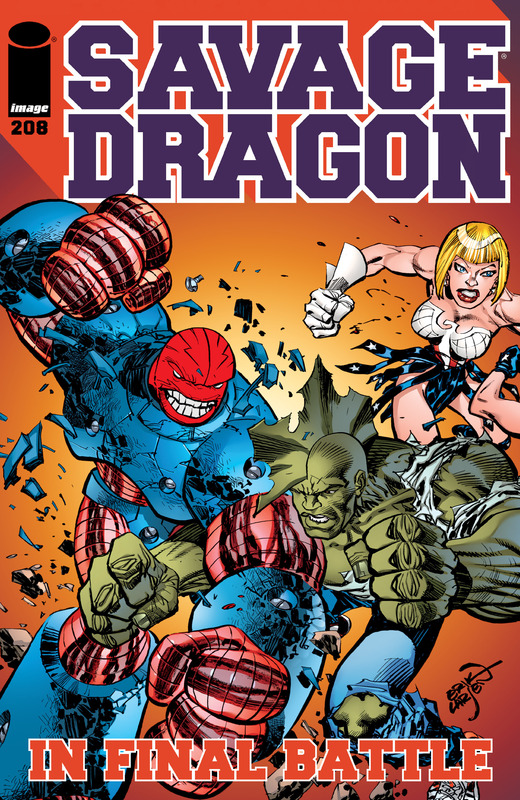 Malcolm Dragon leaps into action against his target as Battle Girl engages with her doppelganger. Angel Dragon grips a hold of her double’s head and repeatedly slams it into the armored form of Battle Tank. Angel notes how the heroes should have been backed up withan entire army as life in this realm has left her a formidable foe. Malcolm is overwhelmed by the armor of Glum who is then shocked by Malcolm’s lightning abilities but this serves only to charge the battle-suit up further. The brutal assault upon the three heroes continues until a desperate Battle Tank is forced to take drastic action. He opens fire with a lethal blast that cuts Angel Dragon in half. The sight of seeing his beloved killed ignites an uncontrollable rage in Glum who casts aside Malcolm to focus his anger on Battle Tank. Glum ruthlessly pummels the helpless form of Battle Tank and despite his best efforts to defend himself, it all proves futile. Malcolm makes a last ditch effort to save his friend but Glum successfully destroys the artificial body of Rex Dexter. This merciless murder causes Malcolm to return with a vengeance. A battered Battle Girl is able to return to her feet and the young heroes are finally able to destroy Glum’s armor and render him unconscious. With this horrendous ordeal finally at an end, a teleportation device is triggered to teleport the group back to Earth where the army is waiting for them. Glum is delivered into the hands of the authorities to answer for the crimes he committed when he used the God Fun to conquer the planet. Horridus checks upon the fate of her husband and is left heartbroken when she learns that Rex has been killed in action. In the aftermath of the fight, Battle Girl wonders if the mission was worth it. Rex was murdered and her double was killed. She thinks that they should have just left Glum and Angel to their own devices in Dimension-X. Malcolm defends their actions as Glum is responsible for the deaths of millions of innocents both on Earth and in Dimension-X. Glum is led away but vows that he will soon be free and that they shall all pay for their actions. y gripped with fear regarding her own fate. Rex died before he could come up with a means of keeping her safe throughout the duration of her pregnancy. Malcolm does his best to comfort his girlfriend and suggests that they go and see Lorella again. They later discuss their wedding plans and Malcolm insists that Maxine invite her parents. She will likely regret it if they do not attend and she ultimately gives in. Horridus is an emotional mess and maintains a constant vigil at the gravesite of Rex Dexter until she is visited by Battle Girl. The recovering hero comforts Horridus as best she can and points out that she has to keep on living, if for no other reason than to take care of her daughter. Meanwhile, Glum sits alone in his prison cell, vowing to soon be rescued by his remaining servant so that he can return to invade Earth. He eventually gives up hope when nothing happens; unaware that Toady is enjoying his newfound freedom. Max Damage has reformed Brute Force with a new line-up and leads them into battle on their first mission against the super-freak BulkHead. He is immediately struck down by the villain, leaving it up to his new teammates to bring down their opponent. Bubble Boy is the first to step up but his fragile body is dissipated by a single blow. A panicked Metal Man transforms into his cast iron form but this simply leaves him immobile. The bemused BulkHead grabs a hold of Metal Man to strike out at Rubber Guy, stretching the embarrassed hero out and rendering him unconscious. Water Lad moves into action but as soon as his hands turn into their liquid form and fall off, he is left unable to defend himself against BulkHead. Wood Boy is able to use his powers to turn a fallen tree into a far heavier type of wood which proves to be too much for BulkHead to hold onto. As BulkHead emerges from the tree, Earth Girl moves forward. She has fully charged herself through eating a large quantity of dirt. She proceeds to pummel BulkHead into a bloody pulp before she finally knocks him out. Max Damage awakens and congratulates Brute Force on their first victory. Bubble Boy reforms just in time to hear that Max’s idea for their next target is none other than the Vicious Circle’s leader, Dart!